Despite appearances, I’ve actually had some time to read lately. Maybe “had some time to read” isn’t totally accurate – it’s been more like “squeezed some time to read” but regardless, it’s the end result that counts, right? And I’ve been lucky, because everything I’ve picked up to read recently has turned out to be a good read. Eye of the Crow was a really, really good read, in fact. 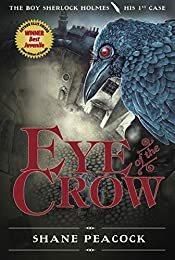 I picked up Eye of the Crow, by Shane Peacock, from the library one day; the “Silver Birch nominee” sticker on the spine caught my eye (as it turns out, it’s won a bunch of awards, including the Arthur Ellis Award for Juvenile Crime Fiction). The book is about Sherlock Holmes’ first case, one undertaken when he’s a boy of just thirteen; I’m a Sherlock Holmes fan, and always on the lookout for good books about Holmes (Laurie King’s Mary Russell/Sherlock Holmes series is another favorite of mine). But Eye of the Crow stayed sitting in the pile of books on my library shelf for most of the three weeks I had it out. So I dashed over to my library shelf, picked up the book, and started reading. I didn’t stop until I’d finished the entire book. The day got darker, my to-do list stayed undone (which, when you think about it, is really not such a bad thing, because it meant all I had to do was re-use the same list the next day, with a few more additions), but I finished the book, my heart racing because it was gloriously, gorgeously suspenseful. I know this is a children’s book, but the fact is, once you start reading, you’ll find yourself drawn into the world of 1860s London – drawn so deeply in you can almost smell the grime and feel the grit. And you’re not going to be thinking to yourself, I’m reading a children’s book – you’re going to be too deep in the story to remember that you actually are reading a book. And really, that’s the best kind of book to sink your teeth into. Peacock has done an amazing job. His boy Sherlock Holmes gives the adult Sherlock Holmes exactly the right childhood background – all the pieces fall into place. The reasons behind why Holmes is the way he is are all there, in the childhood backstory that Peacock has created for the adult Holmes in Eye of the Crow. Not to mention, the suspense builds and builds and builds. This one is a keeper, and for the Sherlock Holmes fan, a must read. This entry was posted in Books and Reading, Reviews and tagged children's books, middle grade, mysteries, Shane Peacock, Sherlock Holmes on December 11, 2009 by Belle Wong.